Winds may have cancelled the race but a few balloons launched for the fun of it. New Haven, Mo. – Today the winds win. Despite the beautiful weather and blue sky, wind conditions are too dangerous for pilots to launch. Special thanks to the pilots, sponsors and crew for coming out today; the race itself is officially cancelled. However some pilots may attempt to lift off for recreational purposes. 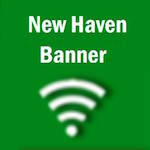 --Today’s parade will start at 1:30 p.m. and begins at the New Haven Elementary School, ending in the city park near Lions Drive. Below is the route, along with a map that can be downloaded to your smartphone and/or printed off.